Neuroscience major sophomore Brooke Demetri, international relations major sophomore Jenna Meldrum and neuroscience major sophomore Annika Mounts chose to encourage discussions about mental illness with their honors project. 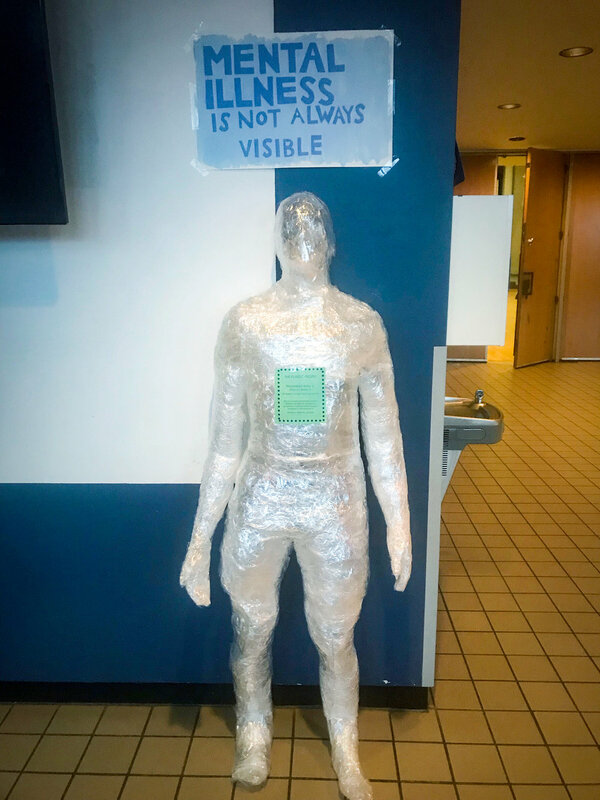 The project involved creating sculptures of human beings from cellophane (pictured above) to represent how mental illness can occur in anyone (courtesy of Annika Mounts). Neuroscience major sophomore Brooke Demetri, international relations major sophomore Jenna Meldrum and neuroscience major sophomore Annika Mounts created an honors project featuring plastic body structures to address mental illness awareness and visibility. The pieces were on display in the MacVittie College Union Lobby and Bailey Hall from April 3 through Friday April 5. The project’s theme was activism, and with the “Out of the Darkness” walk that was held on Sunday April 7, the students decided to address mental illness because of its prevalence on campus, according to Meldrum. Before Demetri, Meldrum and Mounts could create the dialogue they desired, the pieces needed to be created. Demetri explained that building the structures required a lot of tape and saran wrap. Mounts described how each part had had to be wrapped separately before they could form the human figure. Mounts further explained how the pieces were meant to stand out and create an emotional response. Meldrum explained that, especially on the Geneseo campus, mental health awareness is a topic that needs more attention due to limited access to counselors. Demetri revealed that the stressful college environment could be a big trigger for mental illness. Mounts emphasized that students lose their support systems once they are away from home and, as displayed by statistics, students suffer higher rates of mental illness upon entering university. “College students statistically have higher rates of anxiety and depression from a combination of factors, [including] being away from your support system,” Mounts said. While mental illness may affect a large population, it does not have a defined face. Demetri stressed that mental illness affects all people, regardless of how they define themselves. Meldrum highlighted that anyone struggling with mental illness is never alone, which is why the conversation needs to start.